Strange show start. Lights on, Keith walks on stage, his back to the crowd. No sound on his guitar. But 40 years on the road makes some experience. With the main spotlight on him Keith handles the total silence and 12,000 fans waiting for his opening chords in a great way. Still having his back to the crowd, Keith open up the show once he has got the power back on his guitar. "Start Me Up"... "Start Me Up"... From then on I realized the crowd tonight made a lot more noise than last night. 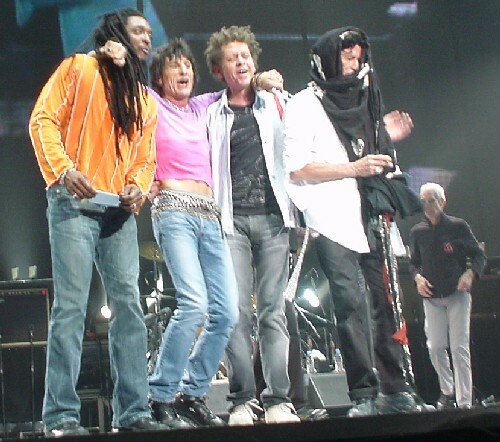 It was a great show, and if you ever plan to see one Stones show only on a tour, then make sure it is the 2nd show. They are always great! The 2nd song for this show was "If You Can't Rock Me". My original posting of the set list for this show listed "You Got Me Rocking". I did make personal notes about the set list, and those notes said "If You Can't Rock Me". Still, the RS official set list said "You Got Me Rocking". I do always mix up these songs, as my brain is kinda mixed up all the time, always mix up left and right etc. But I remember for sure the Darryl Jones bass solo. So I trust the feedback I have got and my own notes. The 2nd song for this show was in fact "If You Can't Rock Me", even if the official set list don't say so. I've only seen the Stones at Wembley Stadium shows in the 90 & 95 so this was the closest I've seen them ... specially during the B stage songs. The closer you are the more you can appreciate Keith solo's, that Ronnie really is a cartoon character, that Charlie is completely unfazed by it all and that Mick's relentles energy is just incredible. Great stuff although on a personal note I was disappointed to not have seen 'Can't You Hear Me Knockin' - much though I like 'Midnight Rambler'. I wish they would either drop 'Satisfaction' or at least crop it back to it's original 'pop' format of only a couple of minutes. It is a great 'pop' as opposed to 'rock' song that I for one don't really think lends itself to extended soloing ... 'Jumpin' Jack Flash' and a couple of others come into this category also. That said 'Midnight Rambler' still comes over as a great contemporary blues tune and it was brilliant to see 'Mannish Boy' from so close. It really invoked memories of that video clip of Keith, Ronnie & Mick playing it with Muddy Waters in Chicago in about 1981. Just reading the note on the 2nd Brisbane show about how the Stones played "If You Can't Rock Me" instead of "You Got Me Rocking", which was on the official setlist. 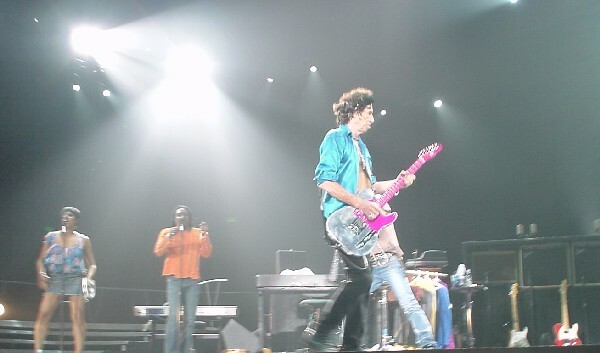 Keith played the wrong song by mistake - when he started playing "If You Can't Rock Me", Mick and Ronnie gave him a funny look, and Mick went up to Keith and told him he was playing the wrong song. Keith then walked up to the setlist written next to Charlie's drums, had a closer look, and realised that he'd started playing the wrong song. When it got to Ronnie's solo, I saw Mick ask Charlie if Ronnie would be able to play it, because he had his slide guitar that he uses for his solo on "You Got Me Rocking". He was fine - Ronnie ended up playing the "If You Can't Rock Me" solo with a slide, and it sounded great!!! It ended up being a fantastic version of "If You Can't Rock Me".